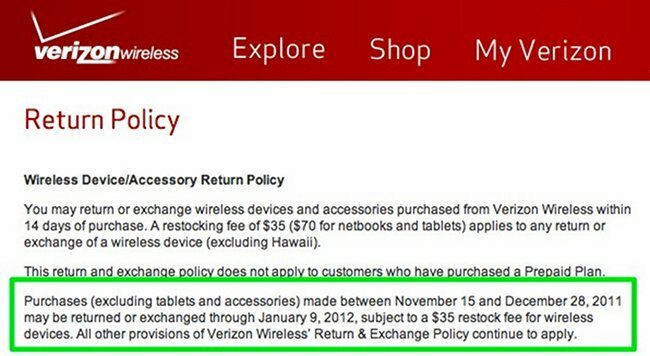 Verizon has been operating on a 14-day return policy for most of the year. Since this went live, we have seen a variety of devices get spaced out by 14 days to help decrease the number of returned devices. With new top tier Android smartphones coming out almost weekly these days, this move – while unpopular for the most part – makes sense. We have some good news though thanks to some eagle-eyed readers who noticed that Verizon had made a slight tweak to this policy. Starting tomorrow (November 15), you can purchase a smartphone and have until January 9, 2012 to return it for something else. With the RAZR, Rezound and Galaxy Nexus all becoming available over the next few weeks, this is incredible news. If you are dying to have a new smartphone, but can’t wait for the G-Nex to finally arrive, then you may want to check out a RAZR or Rezound knowing now that you have until the first week of January to swap it out if you decide stock Android is indeed your cup of tea. You will have to pay a $35 restocking fee if you do bring your phone back. I guess that’s the price you pay to test drive.